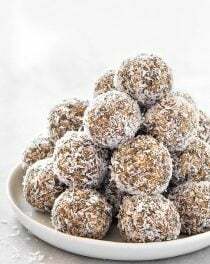 Are you looking for a quick, easy, and no-bake summer dessert? 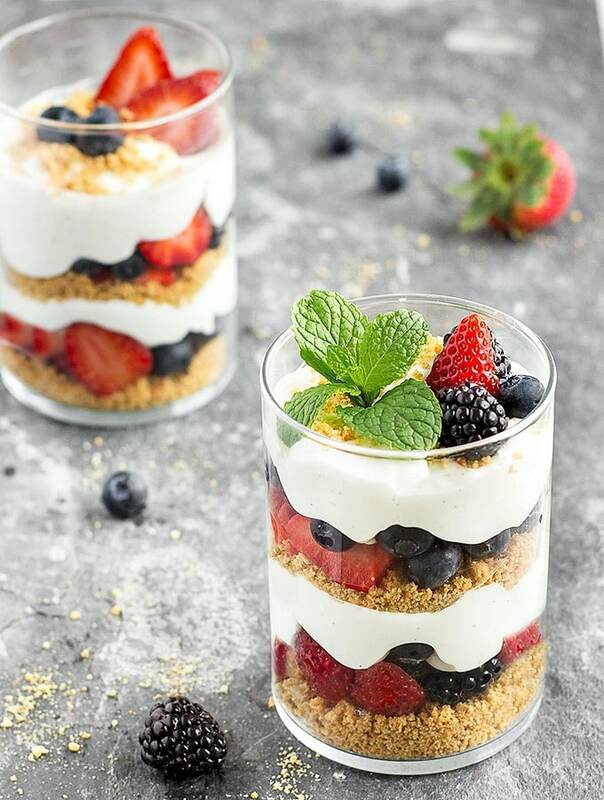 Try these lighten-up Berry Cheesecake Parfaits! Cheesecake parfaits are very easy to make. 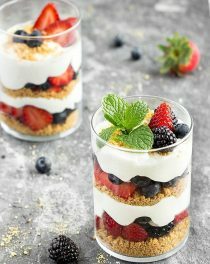 Simply alternate layers of graham cracker crumbs with a creamy vanilla cheesecake filling, and fresh mix berries. To make the cheesecake filling I combined fat-free cream cheese, plain 2% fat Greek yogurt, vanilla bean, and sugar in my stand mixer and whipped it until it was smooth. It’s not healthy but definitely lighter than a traditional cheesecake. For the crumbs, crush the graham crackers in a food processor or use a rolling pin and a zip lock bag. If you can’t find graham crackers where you live, digestive biscuits are a great alternative. I served these berry cheesecake parfaits in juice glasses but you can also serve them in mason jars or cocktail glasses. 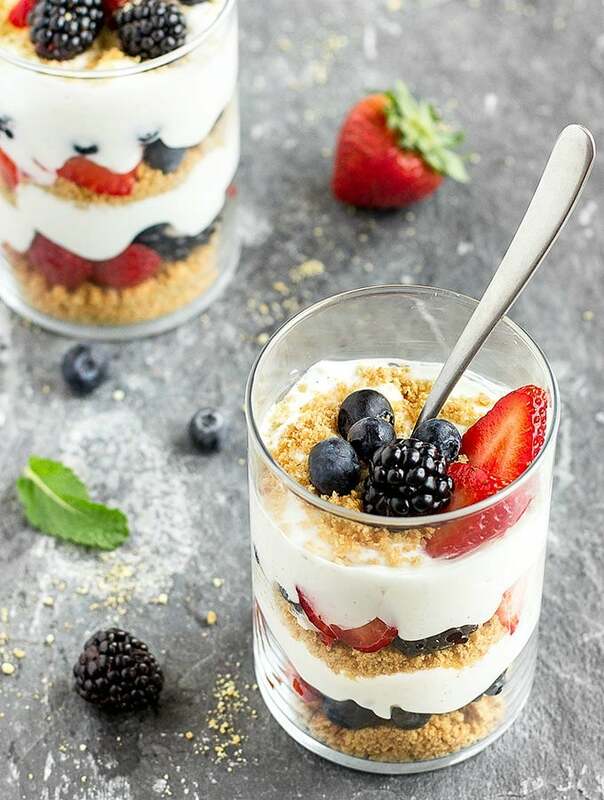 Crumbs and fillings can be prepared in advance and stored in the refrigerator, so all you need to do is assemble your parfaits right before dinner. Parfaits are perfect to take along to a BBQ, 4th of July celebration, or just for a no-fuss dessert any day of the week. Grab a spoon and get ready to dig in! 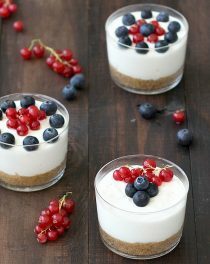 If you try these berry cheesecake parfaits, let me know what you think! Leave a comment and don’t forget to take a picture and share it on my Facebook page or tag it #aseasyasapplepie on Instagram! Put the graham crackers in a food processor and pulse until finely ground. Mix the crumbs with melted butter until evenly moist. In a stand mixer with the whisk attachment, beat the cream cheese, Greek yogurt, sugar, and vanilla until smooth and creamy. Layer the parfaits starting with 2 tablespoons of crumbs, then a layer of berries, cheesecake filling, and repeat. 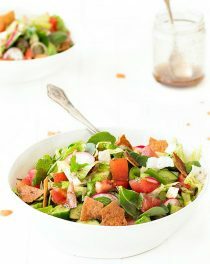 Sprinkle the top with some more crumbs, garnish with berries and a mint leaf. Place in the fridge and chill for about an hour.